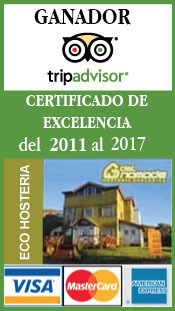 With the following gallery I will demonstrate the amazing access to nature from our observatory, the Panoramic Apartment at Del Nomade Eco Hotel. Designed for photographers, as with the rest of the rooms at Del Nomade, there are several access points to plug into and charge all of your batteries and be able to work and edit at the same time. The primary attraction and difference with the Panoramic Apartment is its height, independence from the rest of Del Nomade and the amazing views of the natural wonders that Puerto Piramides provides. This first image was taken on a warm day in summer, Cecilia and her family, returning from a walk, stopped on the edge of a sand dune, just across the street in front of Del Nomade. One simple and unforgettable “click” from the main window of the Panoramic Apartment froze the moment. Sunsets clearly mark the contours of the sand dunes, detailing the bushes in backlight. 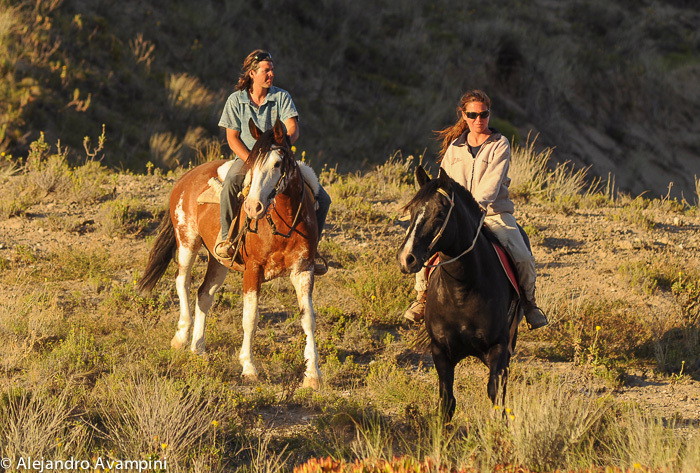 In this particular image, Vicky and Gerardo, who offer horseback tours, came over specifically for a sunset photo shoot from the Panoramic Apartment. 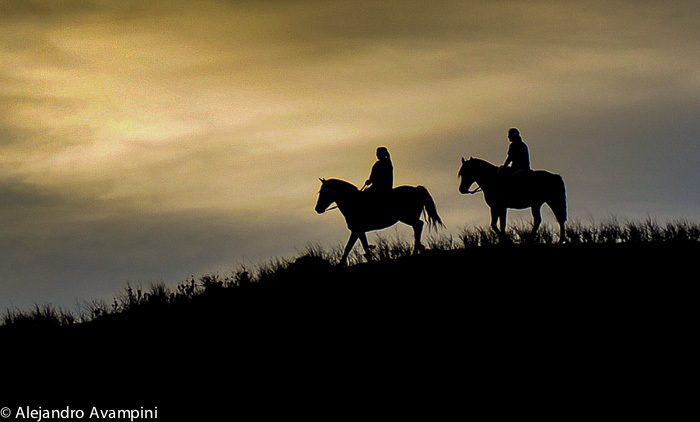 Just before entering in backlight I was able to capture this image. Perched on the top floor, the Panoramic Apartment rests at the same height as the sand dunes just behind Del Nomade, a natural, quiet and private space. The following image is of a whale watching tour and I think it speaks for itself. I have enlarged the subject matter, as with some of the other images below, to better illustrate the situation. With nothing more than my Nikon D-90 and a Nikkor 80-200mm lens I was able to capture, at a distance of nearly 1km, a Whale Watching boat returning to port and in the background, a whale’s fluke raised out of the water. During whale season this kind of situation is repeated almost daily. From September through November it is normal to observe a concentration of whales in the bay of Puerto Piramides. The Panoramic Apartment is an unconditional observation platform of the Golfo Nuevo. The mouth of the Gulf, where open ocean and the South Atlantic sea are found, some 60km in distance, can be seen from the apartment. 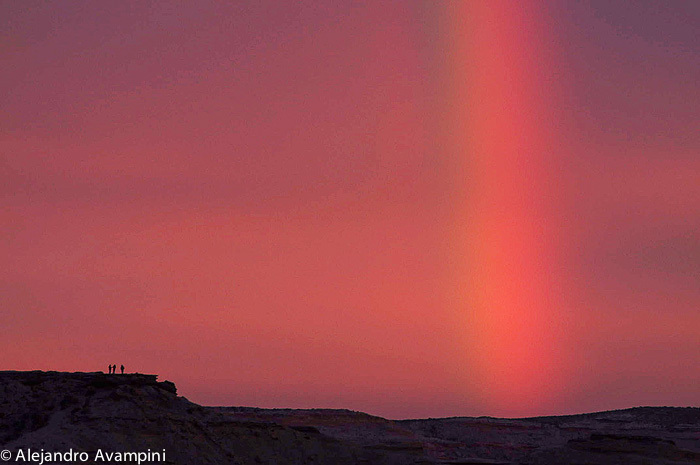 An interesting mirage effect is often produced by the light refracting off the atmosphere. This effect is clearly registered in the following image with a whale watching boat and eroded sand-stone cliffs in the background. 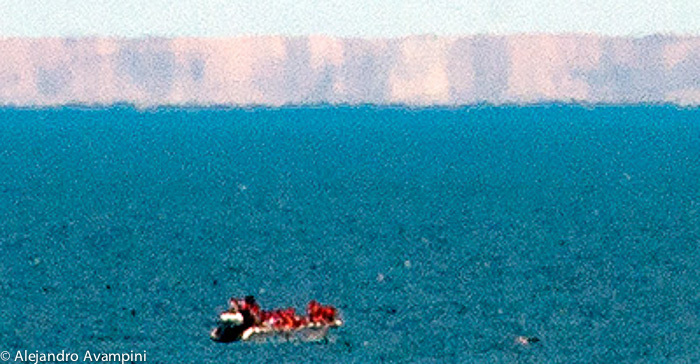 The other side of the gulf, which appears enormous on the horizon, is a 70mt cliff which, at a distance of 60km and in normal conditions, would be seen as a thin line. This mirage is commonly associated with dry and hot environments but will also occur in extremely low temperatures. The mirage effect in this image is called a superior mirage occurring when the lower layer of air is much colder than the upper layer, causing the sun’s rays to bend downward. This effect is frequently observed from the apartment and often the process of the changing mirage can be perceived, an optical illusion that allows us to see images that lay beyond the horizon line. The following image is another of those instants that seem almost eternal. A group of some 10 vultures were gliding up in thermals just above us. Observing the scene unfolding, I stopped whatever it was that I was doing and grabbed my camera. Living surrounded by nature and to enjoy capturing special moments requires preparation. The Panoramic Apartment is spectator to a succession of incredible natural situations, the most predictable and often memorable being sunrise and sunset. That moment of magical light comes and goes in an instant. Knowing this and seeing the vultures moving closer I went out on the terrace a waited to capture the moment when one of the vultures glided across an almost full moon. 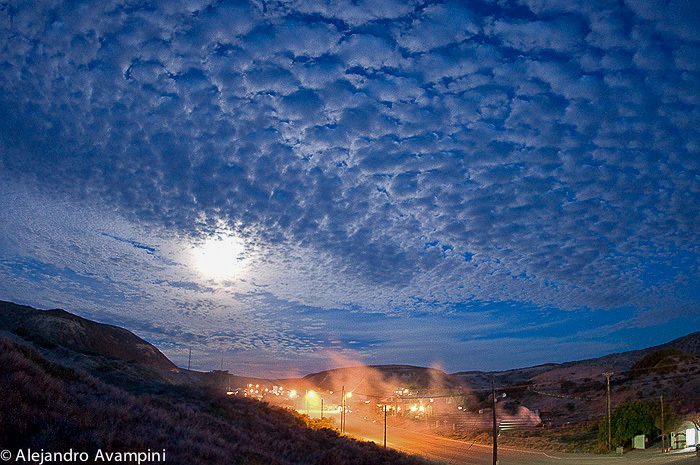 Here, another moonrise but this time with a smaller waning moon. 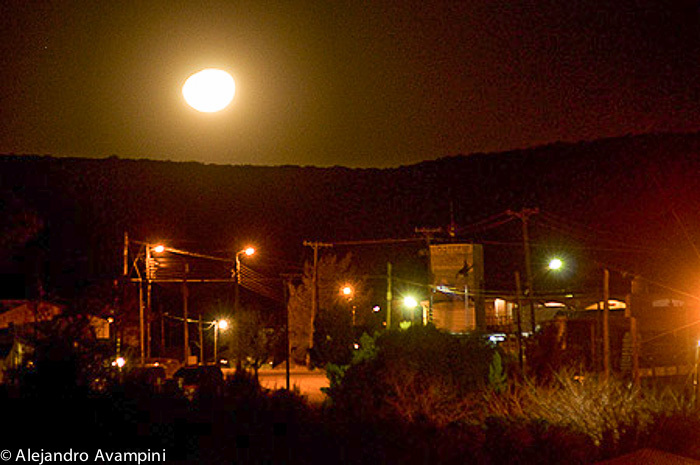 Puerto Piramides is a quiet and calm town that allows for walking and exploration at any time of the day or night with absolutely no need for worry. I recommend walking the beaches at night or if the moon is full, the sand dunes that rest behind Del Nomade, both amazing natural theatres for observing the universe. An open invitation waits for enjoying the millions of stars that make up the Milky-Way and all the others that accompany the immense Cosmos. This next image unveils a suprising natural scene. 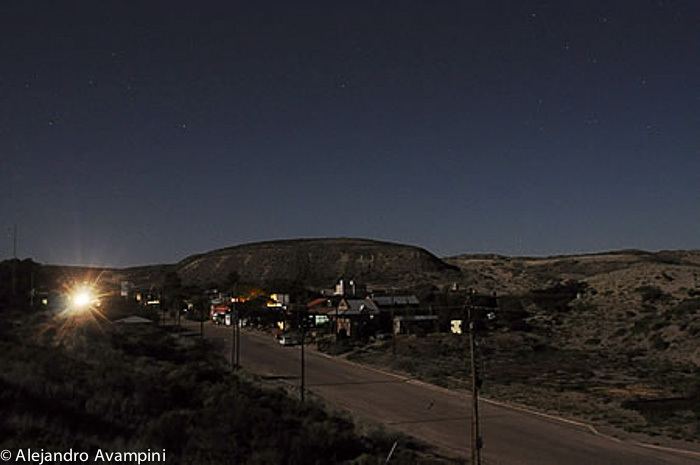 With a sea of clouds bathed in moonlight, Puerto Piramides and its few street lights allow excellent natural vision in the street and public spaces. It is easy to perceive from the Panoramic Apartment a day to day world in which one is witness to the majestic nature of the Valdes Peninsula. 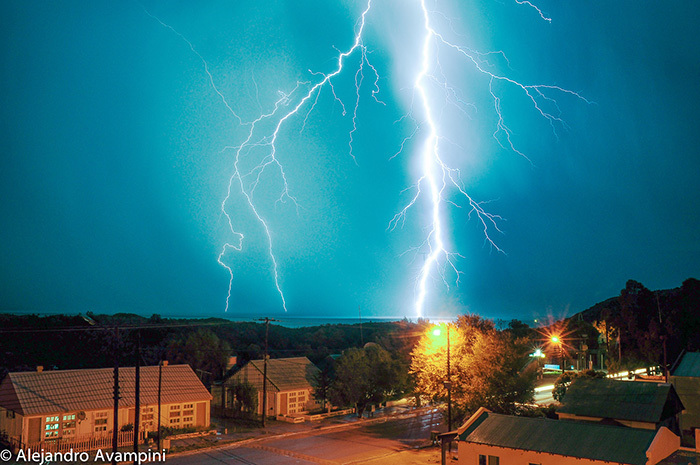 A heavily charged electric storm passed over Puerto Piramides, not a good time to go outside. In the short half an hour of lightning falling over the sea I was provided enough time to open one of the windows of the Panoramic Apartment, position my camera on a tripod and in bulb exposure, wait for the next bolt to crash into the sea, resulting in a frozen record of the unmeasurable power and beauty of lightning. What little yearly rainfall we get in Puerto Piramides and over most of the vast region that comprises Argentine Patagonia, is always welcome. With such a vast horizon and wide open sky it is common to see a rainbow after the rain passes. 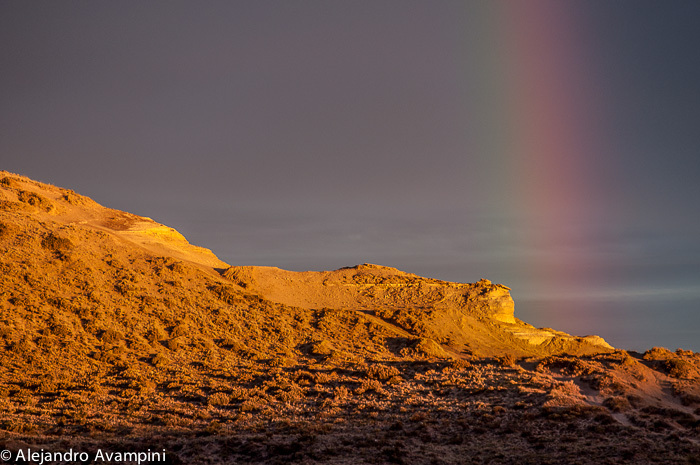 In this photo you can observe a portion of the rainbow resting on one of the cliffs that surround of our town. The Panoramic Apartment offered a more than comfortable perspective for taking this image. With thermal regulated flooring, large double-paned glass windows and several other finishing details, one is guaranteed, even after a long day of adventure outside, continued contact with nature in the comfort of the Panoramic Apartment. The following three images were taken from the same window at different times of the year, comprising a visual register of the incredible variations that are observed in this landscape. Varying tones of Brown color this scene while clouds darken and shade the cliffs in the background which close and form the Bay of Puerto Piramides Every afternoon is unique and each season provides different angle for the sun’s rays. With an open and integral vision the Panoramic Apartment and all of Del Nomade’s installations maintain a connection to and are enveloped by its natural surroundings. 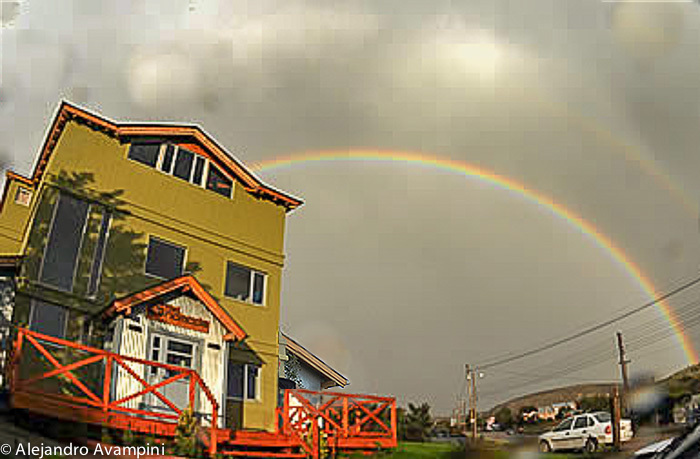 Another rainbow where the three tiny models in the image are visitors staying at Del Nomade Ecological Hotel. They went out for a walk in Puerto Piramides and climbed a steep hill in order to better contemplate the sea in this magical moment. From the main window at the Panoramic Apartment it took nothing more than a quick composition, a light reading and a push of the finger to register the immensity of the moment. 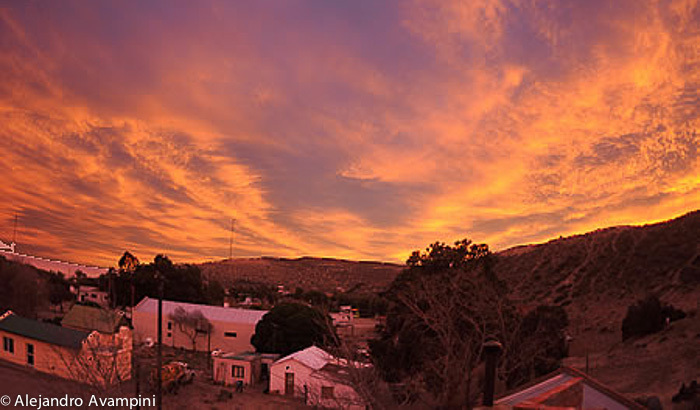 The next sunset was photographed from the main living space. A monotony of celestial abundance with unending skies, sand dunes, the sea and the whales, as if from some movie set our little town offers so much to see and do. The image of a waxing moon setting over a sand dune in summer observed from the master bedroom window while lying in bed with my wife, a romantic moment at home. 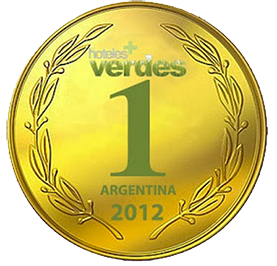 This is a true luxury and an option that we invite those willing to live the experience, to choose. A tourist option created for those who are passionate nature lovers, who enjoy contemplation and are thankful to not have to leave the apartment to look for anything, because they have all they need right where they are. Inspired by the vastness of the Valdes Peninsula, enjoy your vacations in this amazing location and from the Panoramic Apartment at Del Nomade Ecological Hotel. Make your reservation now. Watch whales from the apartment all day long in the privacy of this comfortable space and with the attention of a small staff ready and willing to respond to your questions and needs.